One of the cool things about curated music events like this one is that the talent has been sifted through by a music industry insider who is staking his or her reputation on the caliber of talent in appearance. As a result, they are often talent-packed events that offer a chance to discover several future-favorite artists in a single night, with a much higher hit-to-miss ratio than a typical multi-band local club night. This particular event was organized under the banner of Nina Pickell‘s new venture, Off the Stage Music. 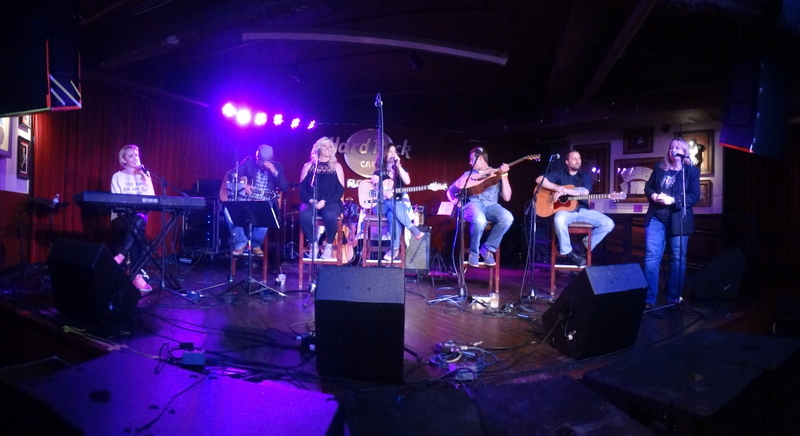 Behind the Songs was designed as a Nashville-style songwriters’ night, with the main portion of the program consisting of five songwriter-performers on the stage at the same time, each discussing and singing one song before passing the baton to the next. Charlie Farren kicked the show off with a short set. Then the special guest for the evening, Paige Davis, sang a single song before retiring to the audience and returning for a short set at the end of the evening. 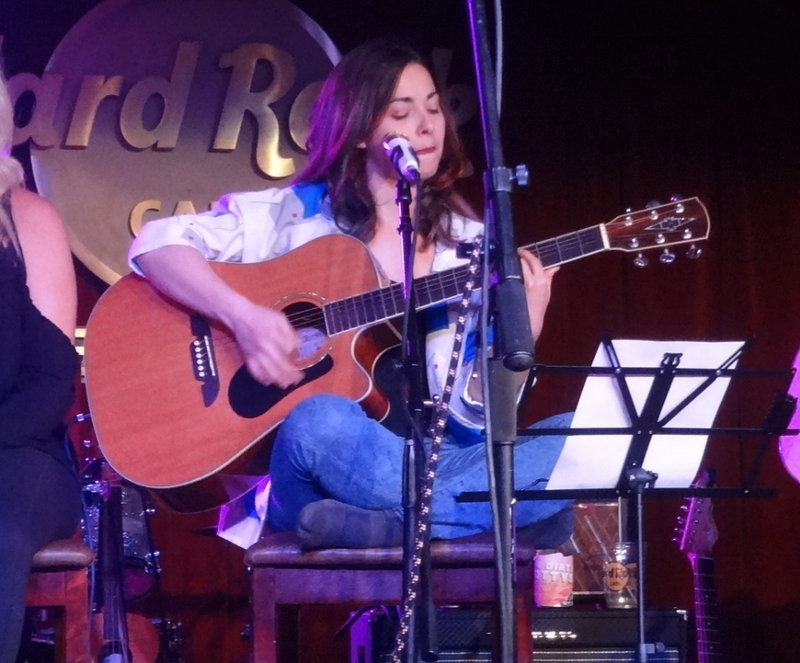 During the main portion of the program, the five songwriters – Annie Brobst, Julie DiOrio, Chris Ruediger, Justin Piper, and Alissa Musto – shared the stage. It’s a format that’s similar to those used in other songwriter-friendly cities, and there’s a plan for this to be the first event of a series here in Boston. Given the relatively full house at this gig, it’s certainly off to an auspicious start. I was quite looking forward to this event. Obviously, you’ve read about Alissa Musto here at the Blog, as I’ve reviewed a live show and her most recent album already this year. And I had been watching the calendars of half of the remaining six artists, hoping to catch convenient live performances from them. So I knew to expect great things from this line-up. Obviously nobody’s “opening act,” Charlie Farren is a local rock icon. 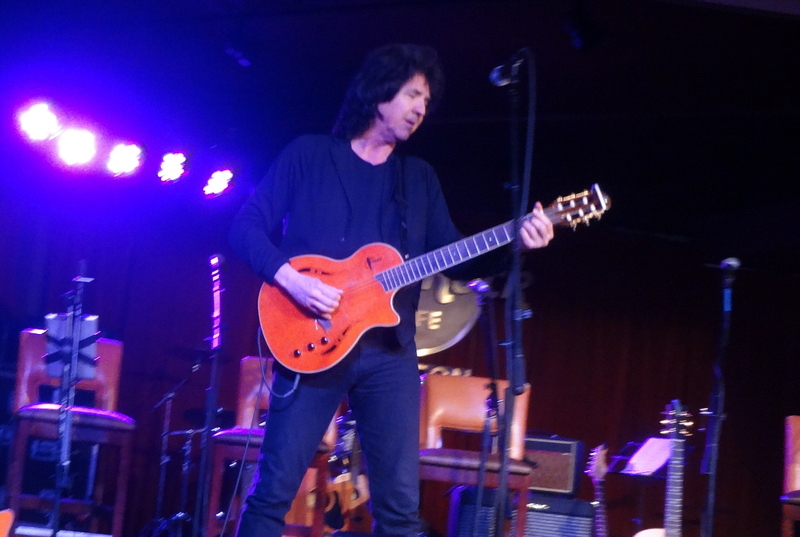 From his ’80s days in The Joe Perry Project and Farrenheit to today, working on his 17th solo album, Charlie Farren is a rock star in every sense of the word, and by opening the music for the evening, his presence was a strong encouragement not to be late. Charlie kicked things off with a short, three-song set. He began with “When You’re Nobody’s Somebody,” a heartfelt, gravelly number somewhere between soft and mid-tempo, filled with power – a rock star’s rock song. Next up was a bluesy, growling rocker, “Hold Me Down and Love Me,” that recalled the best of classic ’70s/’80s guitar rock. And he closed his set with “The Powers That Be,” another timeless rock song that sported a “Baba O’Riley”-esque guitar riff. The set was a terrific appetizer, serving as encouragement to catch one of Charlie’s full concerts when the opportunity arises and also setting the table for the talented performers to follow. 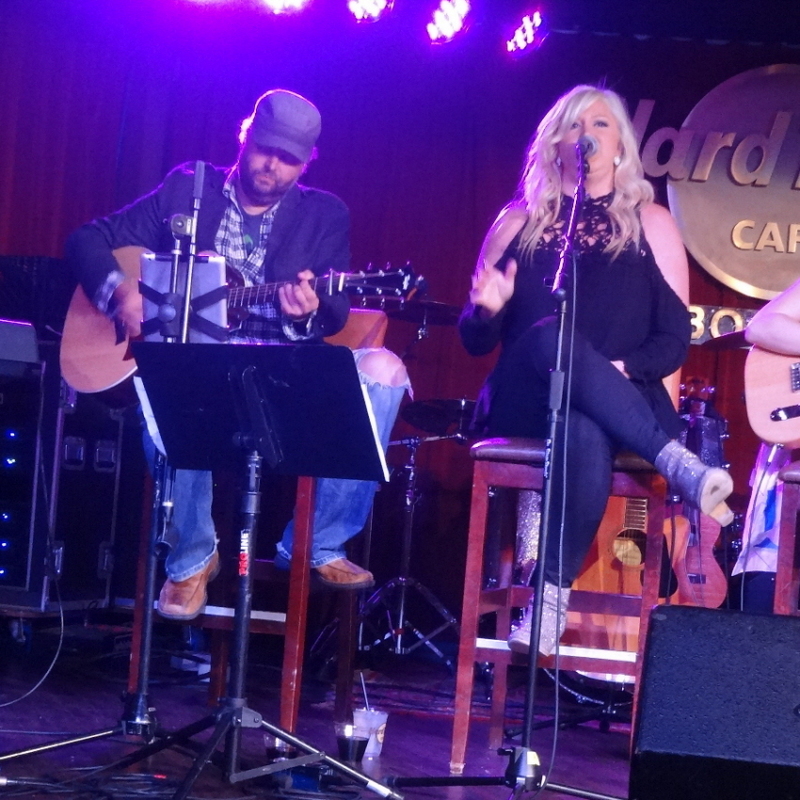 The songwriters-in-the-round portion of the event featured five songwriters – award winners and rising stars – taking turns talking about and performing their songs. The unique Boston spin on this Nashville-inspired songwriters’ night was the variety of genres involved, a diversity of styles so broad that each transition between artist nearly required a bit of gari to cleanse the palate. The evening consisted of five orbits around the room; i.e., each songwriter eventually performed five songs. Below, I review the night performer-by-performer rather than cycle-by-cycle. The first performer of the songwriters’ round was Annie Brobst. Annie was joined onstage by her guitarist, Ryan Dupont. My first instinct was to call her a Miranda Lambert-reminiscent country singer, and, indeed, she talked about how many of Miranda’s songs she covers during her performances, so I suspect that’s not a bad comparison. To the extent she strays from the Miranda position on the country spectrum, Annie voice tends toward that of the classic, timeless stars. The first song she performed – the one that sparked that comparison – was “What’s a Girl Gotta Do.” Annie’s second song, “(Stone in) Still Water,” was emotional and powerful with a bit of old-school country flavor. “You’ll Love Again” showcased Annie’s strong, emotional voice and was powered by a super-catchy guitar line. “Ghost” was a true-blue country music story-song delivered with an interesting flavor – I think I heard a little Jim Croce in the delivery. And Annie’s final song, “Paper Weight,” utilized great lyrics (yes, with a little anger) driving a power and edge to her vocals, punctuated by dramatic guitar pauses. Indeed, Annie performed a variety of songs that showed off her broad country range. Next up was Julie DiOrio. What a dynamo of excited, crowd-engaging energy! Another attendee at my table called her “adorable,” and, indeed, that’s apt. Julie was also the only of the five songwriters to attempt to sing the bass line (and other instrument parts) in a couple of her songs. Her first song, “This Nonsense,” was one of those. She sang half of the song each in its original (smooth) version, the second half in its band (alt-funky and a little edgy) version, with the tune getting frantic toward the end. “Ain’t Got the Time” combined crunchy, classic rock guitar supporting funky soulful vocals. Perhaps a hint of Amy Winehouse; in the neighborhood of Elle King. “Dragonfly” was a funky-cool song with a herky-jerky, fun tempo. “Not Too Call,” I think (messy handwriting), was a dynamic, fun tune featuring vocal gymnastics and a ukulele. Of course, “ukulele” renders the word “fun” redundant, but so does “Julie DiOrio,” so I’ll stick with it. And Julie’s final songwriter’s night tune, “The Furniture,” was soooo lyrically clever with an edgy, swingy, alt-rockin’ sound. And it, like so many of this charming songwriter’s songs, came to a cool, abrupt ending. Chris just graduated from high school this spring. The dude is 18 years old but has a veteran, calm, confidence stage presence and a voice that has that certain je ne sais quoi that makes you sit up and say “Duuude!” (or maybe “wow” if you’re not a “dude”-sayer). This event also doubled as the EP release show for Chris’ five-song EP, Secrets. Chris referred to the Marvin Gaye groove in “Secrets,” and yes, you could really hear some R&B influence, Chris’ performance even hinting at a near-syncopated rhythm in spots. His last song of the night was “Forgive Me,” again featuring that unique timbre in Chris’ voice, combined with lyrics delivered with an urgent insistence. Chris connected so well with this song it actually gave me goosebumps, the sure sign of a song well-sung. This young man has talent to spare and a humble but confident attitude that will take him far. Songs without lyrics. Justin is a guitar instrumentalist. But, you know, by halfway through his opening number, I forgot there weren’t any lyrics. “Rolling Blue Hill” sported an engaging verse, bridge, and a catchy chorus. On “Nova Scotia,” you could hear the song rise and fall, build and relax as it told its story. His third song, whose title I missed, painted very specific pictures for me; whether or not it was the picture Justin was painting, the images I “saw” were of a walk in the woods, maybe a stream, birds, a waterfall, rapids… Next up, Justin delivered a very flowing musical cover of the Beatles’ “She’s Leaving Home.” And he closed his evening with “When I’m Alone”; as an example of speaking with his guitar, one section of this closing number made me laugh, though I wonder if that was an appropriate response given the song’s title. 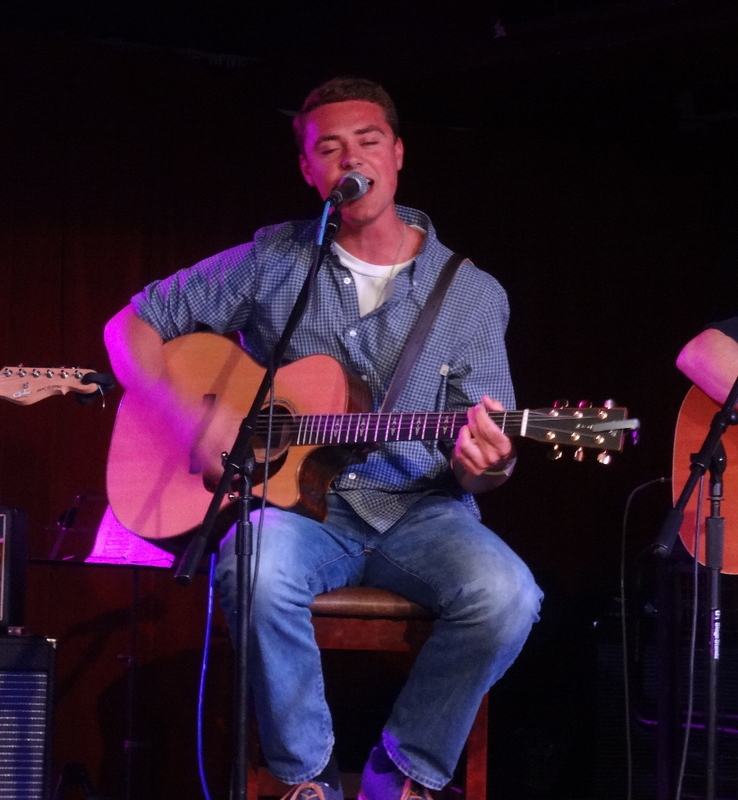 With a broad range of musical influences driving his guitar stylings, Justin was a terrific inclusion in this inaugural Behind the Songs songwriters’ night. Finally, Alissa Musto. What I think of this tremendously talented young artist is well-documented, first in my review of a live show and then in my review of her album What We Saw From the Piano Bar. 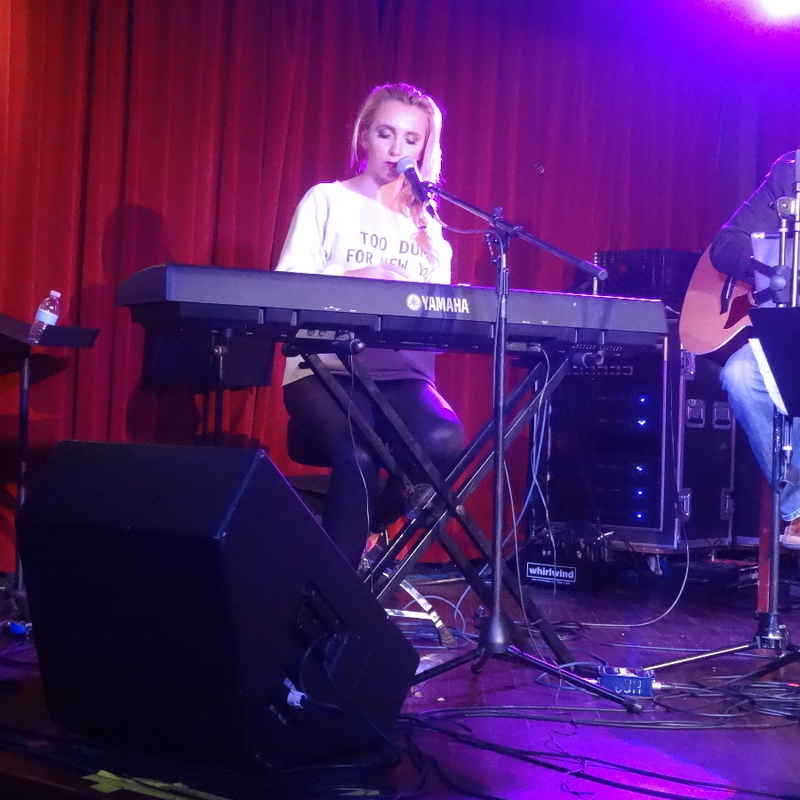 An adept, precise, catchy songwriter with a hint of gravel in her voice that connects instantly with an audience when she sings emotionally and, of course, killer piano skills, this was an ideal setting to showcase Alissa’s talent. She began with “Runaway,” doing her jazzy-pop keys and vocals thing. Man, can she wail emotion, especially impactful when using it sparingly at the edges of rich verses. This particular song rises and falls with her emotions detailed in the storytelling lyrics. Next up was “Temporarily”; dancing pianowork combined with a rich, powerful voice that she unleashed for emphasis periodically. Here, as elsewhere, Alissa exhibited the sort of powerful vocals you might hear in a lounge scene during a James Bond movie, and she combined that with a jazzy-pop edge, as if she was singing with a smirk every now and then. Très chic. Next up was “Black Flak,” a song Alissa really gets lost in, and tonight was no exception, as she delivered serious vocal inflection and soaring waves of powerful piano. Next up, “Pictures on the Wall,” one of my favorites from What We Saw…, a song I caught myself singing along with throughout. This one’s a fun piano song (Billy Joel-meets-Peanuts‘ Schroeder), in which Alissa combines great voice inflection with worth-listening-to, well-crafted lyrics. She closed with an as-yet-untitled song, fun and engaging. I’ll just say the tune was ambitious, confident and clever as f—; inspired songwriting, just our luck. Such a rare, polished (and yet still developing) musical talent, and she’ll be working on a new album this summer, so you can count on reading more about Alissa Musto in the Blog. Paige Davis sang one song in-between Charlie Farren and the “main event,” and she returned at the end to sing four more tunes. 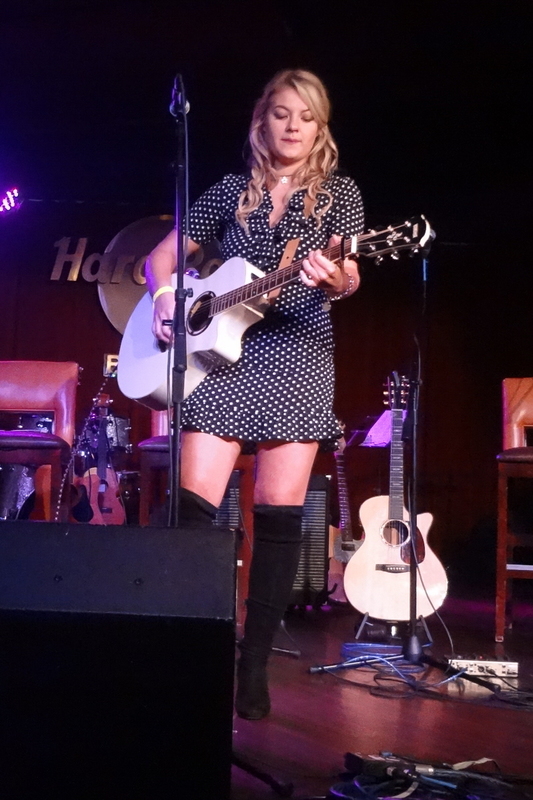 An award-winning country artist at just age sixteen, Paige was a welcome “special guest” this evening. My assessment at the beginning of the evening, based solely on her performance of “Better,” was that she has a sweet vocal with a hint of a twang. Paige connected emotionally with this song, which rises and falls, utilizing stop-start strums from the start. Among the four songs at the end, Paige’s performance of the soft song “I’ll See You in My Dreams” displayed her breadth of skills. This short set proved that, while her vocals are sweet, she knows just where to crack her voice for emphasis and vary her tone for emotion. She’s a strong performer now, already selected New England Country Act of the Year in 2017 at this stage of her career, and she’ll only get better. As I said at the beginning, events like this where the artists are selected for their excellence are a great way to discover multiple fantastic new performers in a single location. Designed to be the first of a series, Behind the Songs was a rousing success, so I expect to see – and attend – more of them, events showcasing more of the many special artists in our music-talent-rich city. 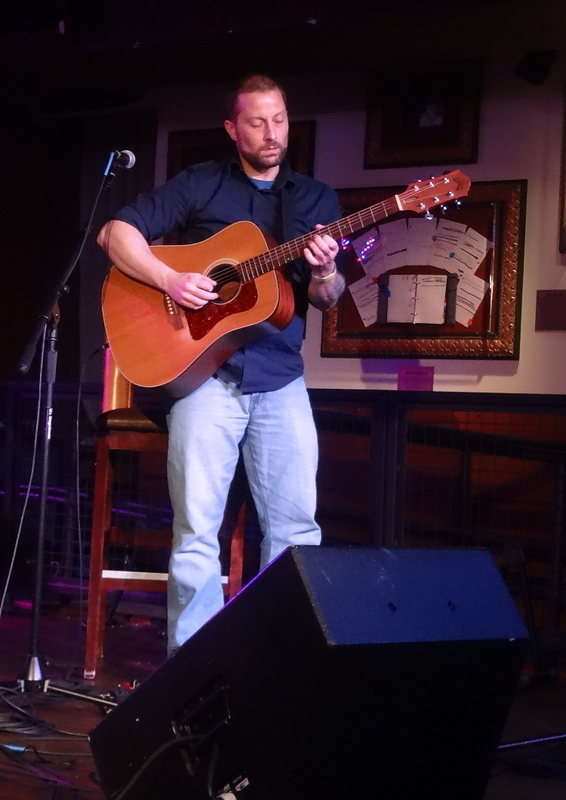 This entry was posted in Live Reviews and tagged Alissa Musto, Annie Brobst, Charlie Farren, Chris Ruediger, Geoff Wilbur, Geoff's Night Out, Julie Diorio, Justin Piper, Live Review, Off the Stage Music, Paige Davis. Bookmark the permalink. FWIW, the song whose title you missed in Justin Piper’s offerings was “Lakeside”. For some reason, the first time I heard it, I immediately had to go off to find myself a copy of the old Raymond Chandler, noire novel, “The Lady in the Lake”. Clearly, you “saw” the appropriate images. Cool. Thanks! Justin’s so great at telling stories with his guitar!